Hungary, used Sept. 6, 1974 (Budapest to Salzburg -- see. (Wien to Funfkirchen/Pecs, arrival cancel 21st), the other. ). Mostly unused.See Pics for Info. Any problems WILL be an honest mistake and I will be happy to resolve it! 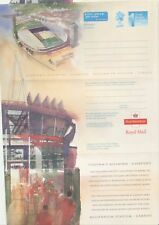 Design features the Millennium Stadium, crowd, sport, rugby, concert, music, architecture, design etc (see scan). Issu ed 1999. Air Letter is likely to be neatly folded along designated fold lines. I have had a shot at stamping with it to show that it is still legible, but I have no proper ink, so the results must speak for themselves. Hinges on the box are loose and it's had a fair few mugs of tea sat on the box over the years. Issu ed 1996. Air Letter is likely to be neatly folded along designated fold lines. Stamp value of 1st Non Value Indicator with Queen Elizabeth II head (see scan). Good condition. SCROLL DOWN FOR ALL SCANS. The Staff at Trenton Stamp & Coin. Design features Text "The Queen" in silver box, portrait of Queen Elizabeth II with necklace and diadem etc. (see scan). Issu ed 1977. Air Letter is likely to be neatly folded along designated fold lines. See photos for further clarification and condition. Bobrujsk is in Belarus. Good condition. SCROLL DOWN FOR ALL SCANS. Zuid-Afrik Republiek. South Africa. Unused Fresh Mint. Debit Card & Credit Card accepted. Mint LOTID149890. Mint, Unused. Debit Card & Credit Card accepted. Stamp value of 12p depicting QE II head, machin (see scan). Issu ed 1979. 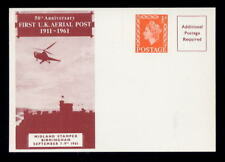 See enlarged scans for stamp values, artwork design etc. W82 1894 Amsterdam Cover Samwells-Covers. Italia 2019 : San Francesco incontra il Sultano - Cartolina Ufficiale Poste It. San Francesco incontra il Sultano. Italia Repubblica - 2019. Abbazia di San'Andrea. Italia Repubblica - 2019. ColorBollo un modo diverso di collezionare. Nel Colorbollo Verde, troverai il francobollo del 2016 dedicato al Turismo ed in particolare al Comune di Carovilli in Provincia di Isernia, riprodotto in bianco e nero da riempire di colori. Special card used on 1924 Wasserkuppe glider mail flight, w. special cancel. Mi. Luftpost LPP 95, v.f. Signed for : £7.95 (item over £40.00). Standard: £2.50 at (item under £40.00). Opens freely, never stuck -- good condition. SCROLL DOWN FOR ALL SCANS. Francesco Morosini. Italia Repubblica - 2019. West Village Osaka to Kobe City Kano-Cho. Sent from: Osaka. Sent to: Kobe. Debit Card & Credit Card accepted. Good condition. Webb (page 207) EN17-P3. SCROLL DOWN FOR ALL SCANS. FRANCE (1923) Pasteur 30 centimes red mint Postal Card with prepaid response! 1933 Russia USSR Zeppelin Postal Stationery Card Postcard to Paris - Ex. Scarce!